Judee and I went to an iPad demonstration last Saturday at the Apple store in La Cantera Shops, San Antonio. We arrived maybe 15 minutes late for the scheduled demo. First impression: movie premiere, rock concert tickets, championship playoff game. What I mean is, there was a line that stretched back way around the corner of the block. A policeman stood at the door of the store. An Apple employee was passing out bottles of water to an orderly but urgent herd of folks--just waiting to take a bite off the Apple tree. And these folks weren't there for the demo. A sign in front of the line urged all those who had "pre-ordered" an iPad,or who were ready to purchase one, to queue up. Every minute or two (literally) people would emerge from the store, to the cheers of five or six Apple cheerleaders, with a smug smile and carrying a white plastic bag in which was enfolded: an iPad. Their very own. We were told the demo was pushed back to ten oclock, so we went for a cup of coffee (in what must be one of the most beautiful shopping centers in San Antonio, La Cantera). Returning, we found the cheerleaders' enthusiasm had not waned, but the line was now less than half as long. We were ushered to a table in the store and an iPad was placed in front of us. Our demo leader showed us how to turn it on (just punch a button and instantly you are in the apple grove, where "magic" hides behind every tree). She then led us through the photos, iBook store, web sites, iStore (where apps reside), email, magazines, newspapers, etc. The touch screen instantly filled our requests and the screen resolution was really good--the color, superb. I even found this blog, Archer's Tracers easily. I am a little concerned about the usability of the on-screen keyboard. Perhaps with more practice it will become friendly, but for the moment it was strange, typing without "feeling" the keys. Of course, by now you probably know you can turn the iPad sideways (from "portrait" to "landscape") and the screen automatically adjusts. The landscape keyboard is larger and one might just learn how to use it. Nonetheless, an external keyboard and dock are available for $69. The wi-fi hookup was either overloaded or underpowered. I read in Newsweek that the antenna for the wi-fi reception may face a "recall" to beef it up. 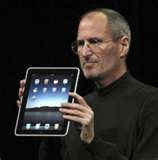 Our demo leader said the slow response (at times) was due to so many iPads in the store all accessing the wi-fi at once. Maybe. I don't understand, but am a little skeptical of that explanation. Nonetheless, I hope to be able to acquire one of these little jewels soon. I am currently involved in an effort to "remotize" my world, by acquiring as many remotes as possible. The goal: to be able to sit in my recliner and control every device in my home without having to get up. (A small refrigerator could double as a night stand.) The iPad will save me from having to go six feet over to my desk and firing up my Dell. And, Judee and I are travelling to England in June. I hope to have a book, a couple of movies, a game or two loaded up for the flight over; and maps of London, guides to places of interest, and instructions as to how to get on the Tube--all accessible on my iPad--snuggly tucked into my back-pack. Where is that tree of the knowledge of good and evil? I relish the first bite.